This entry was posted on February 14, 2012 by Andie Pantazi. 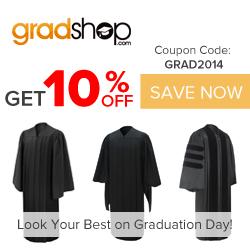 Your graduation is a momentous event and it is important that you are wearing the correct style of graduation gown. Most college and university graduation ceremonies require a black gown. However, this tradition has changed through time. Graduation gowns now come in various colors and fabrics. Some universities require their graduates to use gowns that correspond with the school’s official color. For high school graduates, the general graduation apparel is the cap and gown. The same is also true for those graduating with bachelor’s degree. However, for a doctoral degree a doctoral hood is worn over the robe. This article will help you on how to effectively wear your graduation gown to look at your best on your special day. The first thing you have to do is to know the school requirements pertaining the color and the design of the gown. You will need to do this so you will conform to the guidelines and you will have enough time to look for the right gown for you. Some schools may also have specific rules even with the clothes you will have to wear underneath your gown. Use appropriate clothes and do not forget to choose the type of fabric and design that will allow you to move comfortably. Your shoes have to match your dress as well. After the graduation ceremony, you will have to take off your gown and you have to look good in your personal choice of clothes. Next, you have to wear your gown the right way. You will have to wash your gown thoroughly and iron them well before putting them on. Use your gown in a way like you are putting on your overcoat. Check if the sleeves of your gown stretch down to your wrists. However, a doctoral gown has a different design for the sleeves. The usual design is bell-shaped sleeves that are exactly fitted on the wrists. Generally, the length of the gown is just about your mid-calf. When you have worn your gown, check in front of the mirror and smoothen the fabric of your gown. Check for any unfavorable thread hanging from the hem. Third, if your gown has a hood you have to drape it smoothly around your neck. Make sure that the longer end of the hood is positioned at your back. You will notice that these hoods may have a cord in front. This can be attached or looped around the button of your shirt or you can use a pin to secure it. This will prevent the hood from falling off. The velvet part of the hood represents the color of the degree a graduate has earned. On the other hand, the satin portion of the hood represents the university from which you have graduated from. It is generally used that the velvet portion is worn on the outside while the satin part is worn in the inside. Lastly, on your graduation day make sure that you will have your hair done in a neatly fashion. For women, you can ask your hairstylist to do your hair neatly. For men, you can have a clean haircut a couple of days before your graduation. Make sure to put on some make-up and dab some powder before the graduation rites begin. Make your graduation day a day to remember. Your parents will be taking photographs of you so put on your best smile for the camera. Capture this special moment in the photographs that you can look back to. Make sure to wear your graduation gown the most effective way.